Since 1989 we have monitored small mammal populations at a semiarid site in north-central Chile with a largescale livetrapping grid complex. Selective exclusions of vertebrate predators or putative small mammal competitors, or both, have yielded relatively small or mostly transitory effects, or both, on small mammal population dynamics and plant community composition. During the study period 5 El Niño–high rainfall episodes have occurred lasting 1–3 years. Resident or core small mammals such as Abrothrix olivaceus, Phyllotis darwini, and Octodon degus experience dramatic fluctuations during and following rainfall pulses. Temporary resident or opportunistic species such as Oligoryzomys longicaudatus and A. longipilis disappear from the thorn scrub for varying periods of time. All species persist in more mesic nearby habitats near dry stream courses (aguadas). Since a 3-year high rainfall event in 2000–2002 mean annual rainfall has increased in this region, mainly due to a lack of prolonged droughts. Under these conditions, and building on a qualitative model proposed by Noy-Meir, long-lived species might become more abundant. 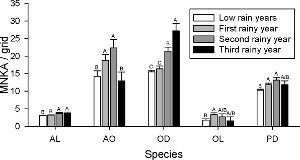 Changes in the small mammal assemblage are consistent with these predictions; O. degus, a caviomorph rodent with a long life span, now comprises a more constant proportion of the small mammal biomass in the thorn scrub, and we have documented reduced variation in species diversity. Increased rainfall, a predicted consequence of global climate change in this region, might be leading to changes in small mammal assemblage structure and composition and ultimately will result in a more stable, less oscillatory assemblage in the thorn scrub. Additionally, invasive groups such as introduced lagomorphs and ephemeral plants might become more abundant in this community. The long-term consequences of changes in rainfall patterns due to El Nin˜o Southern Oscillations (ENSOs), with important teleconnections to global-scale phenomena, will lead to diverse changes at the community level here.